Although the slingerland name is usually associated with Drums, they started with the Uke. The Slingerland Company was founded in 1912 when H.H. 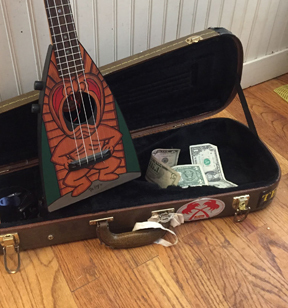 Slingerland won a ukulele instructional book in a card game. The company quickly expanded into producing Ukes and, by 1919, banjos. In 1928, Slingerland began manufacturing drums, and the name was changed to the Slingerland Banjo and Drum Company.